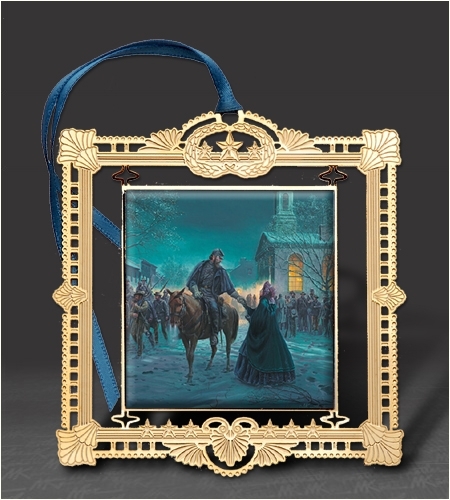 KUNSTLER 2007 COLLECTABLE ORNAMENT – "A FLEETING MOMENT"
Here for your consideration is the Timber Ridge School 2007 Limited Edition Collectable Christmas Ornament featuring Mort Kunstler's 2007 snow scene "A FLEETING MOMENT." This is the 12th in a series of ornaments produced and issued by the Timber Ridge School. "A FLEETING MOMENT" depicts a tender moment between General Stonewall Jackson and his wife Mary Anna. It was at Winchester in the winter of 1861-62 that Jackson established headquarters and brought Mary Anna from Lexington. They’d had little time together during the war and this was the single longest interlude that enjoyed. Mary Anna left Winchester bearing their daughter, Julia, so this was certainly a memorable time for the Jacksons. "A FLEETING MOMENT" takes place on Loudoun Street in Winchester, highlighted by the Loudoun Street Presbyterian Church. It reflects the special relationship that existed between the general and his wife which did much to contribute to the remarkable man we know today as Stonewall Jackson. The church is still standing today, but its appearance has changed radically since the Civil War. Dedicated in 1841, the current façade and steeple were erected in 1883, the steeple replacing the cupola seen here. It seems the perfect setting for Jackson and Mary Anna. This Christmas ornament was produced and issued exclusively by the Timber Ridge School, a licensed residential treatment center and accredited educational program serving young men between the ages of 11 and 19 with a history of serious emotional, learning, and behavioral difficulties. Funds for the improvement of campus programs and facilities are raised through the original sale of ornaments. Mort Kunstler, a very generous supporter of the school, donated the use of his work "A FLEETING MOMENT" for this ornament. No more than 7,500 of this 12th in a series of ornaments were produced. It has a 24 karat gold plated over brass border and is finished with blue ribbon. It is packaged in a silver presentation box with black felt backing and comes with a numbered certificate of authenticity and an ornament stand so it can be either hung on a tree or displayed on a shelf.